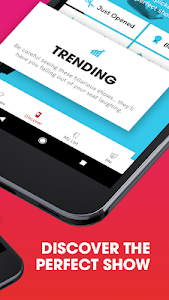 Getting tickets to the best performances in your city has never been easier than with TodayTix, the highest-rated ticketing app in the Play Store. Created by Broadway producers, TodayTix provides insightful guidance into the world of culture, allowing users to discover new shows and unlock access to the best seats at the best prices. 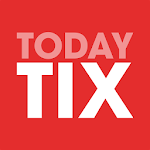 First launched for tickets to New York's Broadway and Off-Broadway shows, TodayTix is now available in London's West End, Chicago, Los Angeles, the San Francisco Bay Area, Boston, Washington D.C., Seattle, Philadelphia, Toronto, Connecticut, Houston, Dallas, and Melbourne. 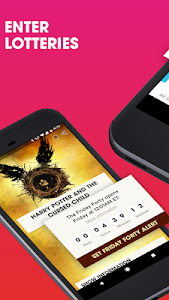 TodayTix simplifies and streamlines the previously difficult theater ticket buying experience. 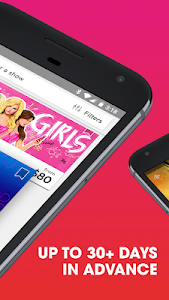 - Take the guesswork out of buying theater tickets. We always list the best prices up to 30 days in advance. - Enter daily lotteries to popular Broadway and Off-Broadway shows. Win free tickets, access to exclusive deals, and more! - Unlock day-of Rush tickets at deep discounts on a first-come, first-served basis every performance day. - Skip the lines. Book tickets in just 30 seconds or less, and never wait in long lines again. - Sign up for alerts. Find out when tickets to your favorite sold out show becomes available. Get reminders the next time Rush and Lottery deals are live. - Get the VIP treatment. Our customers rave about our friendly and personable service. - Buy with confidence. Unlike many other apps, we work directly with the theatre’s box office, never with ticket brokers. 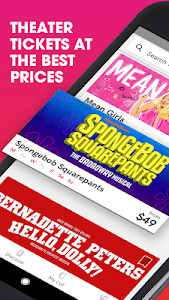 Check out our new mobile Lotteries, Rush tickets, and special offers, as well as other exciting updates and features in the latest version of the TodayTix app. Similar to "TodayTix – Theater Tickets"